There are various possibilities for securing cargoes on vehicles. A positive-fit safety covering is recommended in most cases. However, if the cargo consists of different parts without clearly defined anchorage points, only heavy tension straps can be used. Our nets out of belt straps are a big help here and prevent the cargo from slipping out of place during transportation. All the nets in this series bear the GS mark of tested safety and have been developed in conformity with the stipulations of the Association of German Engineers (VDI) 2700 ff and the European Standard EN 12195-2. The belt strap nets are delivered as a set with the fitting tension straps. They can be deployed both positive-fit (diagonal and transverse lashing) and force-fit (top-over lashing). The belt strap nets have a permanent identification mark and are delivered with detailed operating instructions. 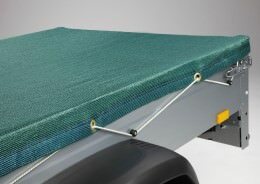 This allows you to secure the cargo on your lorry or transporter very easily. Of all the different options for securing cargoes, a positive-fit safety covering is most highly recommended. However, when cargoes consist of different individual components without clearly defined anchorage points, it’s almost impossible to use tension straps. In such cases webbing nets are used, which restore the positive fit. The webbing net is a special cargo net out og belt straps which serves to secure heavy cargoes of individual components. It represents a practical and flexible method of securing a cargo, which can be used for different cargoes and is quickly installed. 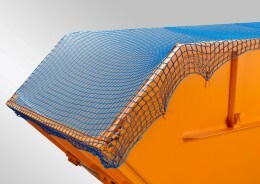 The belt strap nets from Safetynet365 bear the GS mark of tested safety and have been developed in conformity with the Association of German Engineers VDI 2700 ff and the German Institute for Standardisation European Standard (DIN EN) 12195-2 (“Cargo safety of lashing straps on road vehicles”). The cargo nets are offered as a set with fitting tension straps. These cargo securing nets can be deployed both positive-fit (diagonal and transverse lashing straps) and force-fit (top-over lashing). In addition, they bear a permanent identification mark in accordance with the guidelines. When transporting goods, a net is needed to secure the cargo on the heavy goods vehicle. 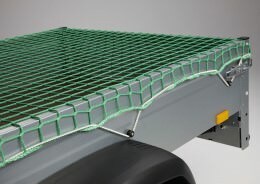 This cargo net for lorries is intended to prevent, for example, pallets from slipping out of place and goods getting damaged. However, securing cargo is not only an important issue for lorries, but for transporting goods in general – which is why our cargo nets have been designed to match the requirements of different types of vehicle such as passenger cars, box wagons and lorries of all sizes. Technically, the material used for the nets is a high tenacity, extremely hard-wearing polyester. The mesh sizes are adjusted to the cargo goods and measure 150 mm or 300 mm. Depending on the requirements, the nets are equipped with four eyelets (e.g. cargo nets for passenger cars) to eight eyelets (for 12 ton lorries) for fastening them to the cargo nets with the corresponding tension straps. Our cargo nets therefore fit not only heavy goods vehicles, but also transporters and sprinters. For covering very small parts, the cargo net is additionally interwoven with a close-meshed covering net. Due to this wide range of possible uses, our nets are suitable for securing both agricultural and industrial loads. In accordance with cargo securing provisions, the tension straps are available in the basic widths 25 mm, 35 mm and 50 mm, enabling you to buy suitable replacements for damaged belts. You can find information on exactly when a lashing strap reaches the point where it must be replaced in the instruction sheet of the German Federal Association of Road Haulage, Logistics and Disposal (BGL). You can find additional materials that increase the effectiveness of cargo securing measures – for example through using edge guards or non-slip mats – in our “Accessories” section. The use of a non-slip mat therefore considerably increases the maximum loading weight. Comprehensive tables showing the maximum loading weight can be found on the undersides of the individual vehicle types and nets.